‘Worlds Remixed’ is the next step in the continued evolution of Porter Robinson’s conceptual ‘Worlds’ vision. 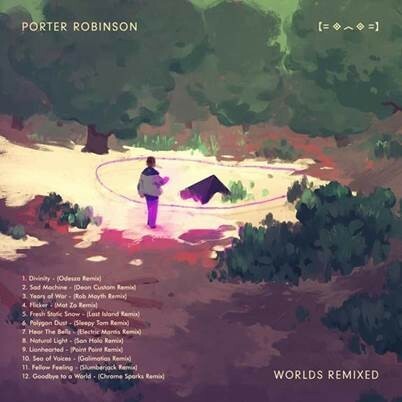 A track-by-track collection of remixes hand-selected by Porter and presented in the same order as the original album tracklist, ‘Worlds Remixed’ (out 2 October on Astralwerks) expands upon the overall aesthetic of Robinson’s debut album ‘Worlds’ and doubles as a platform to show off the skills of some of his favourite artists including Odesza, Mat Zo, Glamatias, Chrome Sparks and more. ‘Worlds’ includes the debut album, the interactive live show and recent design collaboration with Japanese streetwear brand Galaxxxy (which sold out within hours of Porter announcing it via Twitter recently). It all began a few years back, with Porter turning down DJ offers to move back to North Carolina and devote himself to introspection and reinvention. “I figured that one way to develop a unique identity as an artist would be to combine all my favourite things in music — it would result in a collective expression of my taste and experience. Something nobody else has. Designed in collaboration with music technologist and artist Laura Escudé aka Alluxe (Kanye, Jay Z, Yeah Yeah Yeahs, Drake) with visuals crafted by ILN (Invisible Light Network) and edited by video artist Ghostdad, the ‘Worlds’ live show integrates visual and sonic elements into a hyperreal, video-game fuelled dream come-to-life with Porter at the helm. With more than 40 million album streams under his belt, plus 100,000+ in ticket sales for live headline performances and appearances at festivals across the globe this summer, Porter continues to refine (and redefine) his vision for ‘Worlds’.